Walking boots and pint glasses at the ready! 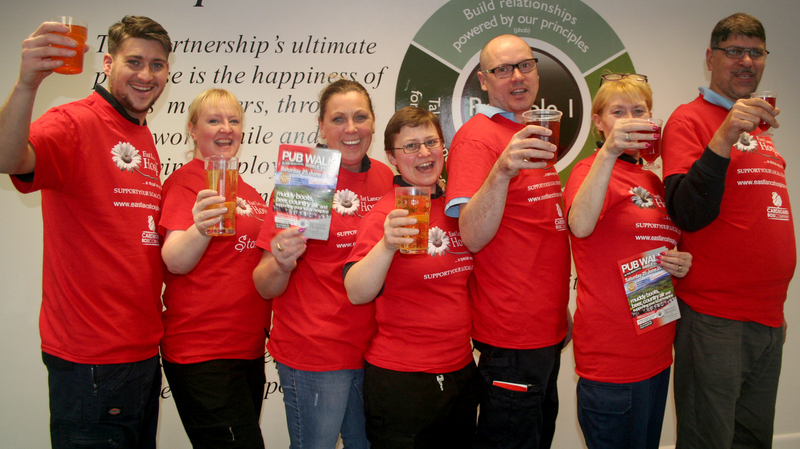 Walking boots and beer will be on the cards as hundreds of charity walkers descend on the Ribble Valley this Summer. Individuals, families and work teams are among those already registered for the 2nd annual East Lancashire Hospice walk taking place in June. Organised in conjunction with the Rotary Club of Ribblesdale, the 10-mile walk will be marshalled by Rotarians and helpers as entrants make their way across some of the Ribble Valley’s impressive countryside to raise hospice funds. Around half a dozen staff from Herbert Parkinson in Darwen, who make products for John Lewis have already pledged their support to the walk, and they hope to enter a team of over 20 in total. Gillian Walsh said: “We’re taking part as the Herbert Parkinson team. The hospice is our chosen charity for the year so everyone knows about the work the hospice does. And we like the sound of a pub walk! A team made up of staff from Pentland Distribution, based in Blackburn have also joined scores of people who have already signed up for the walk. The walk takes place on Saturday June 25 and begins at Whalley Village Hall. The route takes entrants through Mitton and across the Ribble Valley countryside before emerging in Billington and back into Whalley where the walk concludes. Entry is £10 per person and includes an exclusive t shirt. Register now online or call 01254 287011.